Counting down to the start date for the Bass Bits Videos! 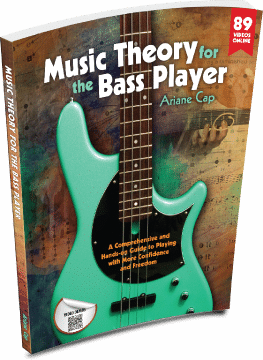 I am putting together a video series for you that presents the concepts from my book, Music Theory for the Bass Player. All the music theory the bassist needs, put to work in music the bassist plays. For more info check out: What’s it all about and why do you not want to miss this? You do not need the book to follow along. You do need your bass, though! Join us! Your questions, comments etc…. are very welcome and encouraged! I finished and published my book, became an educator for TrueFire.com, did a lot of session work (Keith Olsen, Generation Esmeralda, Los Sanders, Lara Price, the Montclair Women’s Big Band [at Lucas Arts with producer Leslie-Ann Jones]), and I am currently recording with my duo OoN. I got to play on stage with two of my biggest heroes, Kai Eckhardt (double bill with his ensemble Zeitgeist, put on by Bass Player Magazine), and Michael Manring (in a beautiful double bill with Manring, Kassin, Burr). I also got to play with Muriel Anderson on two tours, got invited on stage to sit in with Mimi Fox, and did a presentation on Women in Jazz with a project Mad Duran put together. Did some great clinics/seminars (the Women’s and Girls’ Jazz and Blues Camps at the California Jazz Conservatory, and masterclasses at Colorado State with Paul Hanson). And the bass events – fests of low end and friendships! I got to attend the NAMM Show in LA, Musikmesse in Frankfurt, got invited as a VIP guest to the amazing Warwick Camp and Reeveland Festival in Germany. I also got to spend a lot of time with my folks in Austria. Met some cool folks there and got to hang with Juan the Snow Owl. I am not writing this to toot my own horn, but rather to share how happy I am and how rich and varied the life as a bass playing musician can be. Now I want to bring to you what I have learned and continue tokeep learning everyday. Please join me on this blog! There are no shortcuts, but there are proven and fast ways to get results, so that’s why I am here! Mark your calendars, the ‘Bass Bits – Bite sized video lessons for the brave’ are starting on October 30! PS: My TrueFire course is coming out October 13th and on October 26th. I am doing a Google Hangout at a super popular and super awesome bass lesson website (psst – this is going to be very cool! ).